ISLAMABAD: Pakistan has recommended the Facebook management to connect opening of a Facebook account with a mobile number to overcome fake accounts issues. Facebook has designated focal person to coordinate with Pakistan Telecommunication Authority (PTA) for prompt action against any reported material. “Facebook reiterated their commitment toward removal/blocking of the blasphemous and objectionable content and assured that they will improve the cooperation and response time”, PTA official told APP. Mobile numbers are verified through biometric verification system in Pakistan. He said currently Facebook accounts are being opened through e-mail; the PTA can overcome the issue of fake accounts if all existing and current accounts are verified with phone numbers. The PTA has received more than 6,000 complaints online which were reviewed and 350 of them contained blasphemous content that was ultimately blocked. The PTA has established a web analysis cell where 25 personnel are working solely on identifying unlawful content on the internet, including the blasphemous material. 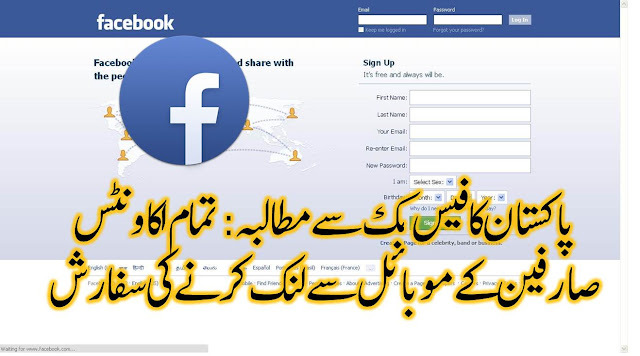 Facebook was also asked to help the Pakistan law enforcement agencies (LEAs) by providing them with the requisite data that they had asked for. Facebook, in response, said that it received around 1,000 requests in 2016 from Pakistan and about 70 per cent of them had been complied with and that they will continue to support such requests.